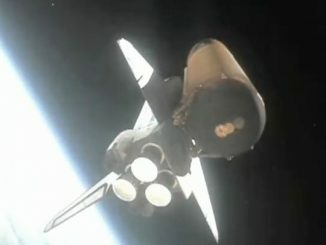 Navigating the 48-mile Panama Canal that slices through the isthmus, the final shipment of a space shuttle external fuel tank emerged into the Pacific this afternoon for a three-week trek to California. The Shannon Dann tugboat pulling the Gulfmaster I barge loaded with External Tank No. 94 arrived at the canal’s northern inlet last Saturday. 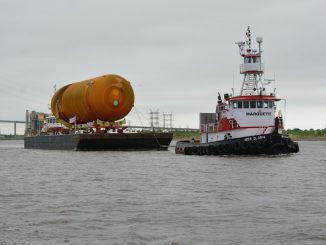 The tank left its NASA factory in New Orleans on April 12. The slow progression from the Caribbean Sea to the Pacific Ocean saw the tug and barge, plus a canal-provided assist tug pushing, make the journey through a system of locks to rise and fall in height to make the crossing of Panama. The initial portion of the passage was completed Monday before emerging into the Pacific today. 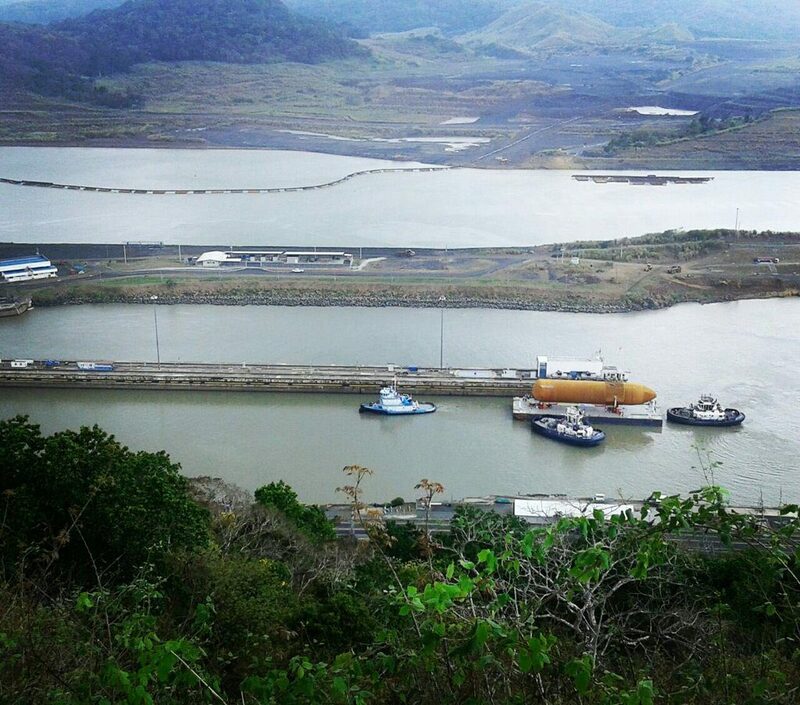 Monday saw the tank traverse the Gatun Locks, a set of three locks between the Caribbean Sea and Lake Gatun. The voyage resumed today with passage through the Pedro Miguel and Miraflores Locks en route to the Pacific. It was the fifth shuttle tank to make the canal transit. Four tanks were shipped to Vandenberg Air Force Base in California in the 1980s before West Coast shuttle launches were cancelled after Challenger. They were later shipped to Florida and eventually launched. Now in open waters, the barge will be traveling around-the-clock, heading toward the final destination of Marina del Rey along California’s Los Angeles coastline. It is scheduled to arrive around May 19 for a planned May 21 parade through city streets to the California Science Center. The tank will be used by the museum to display the retired orbiter Endeavour in the vertical as if she still sat on the launch pad. 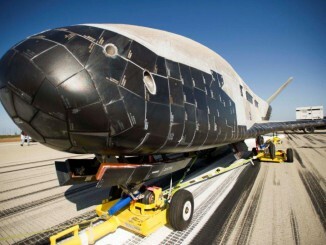 See our coverage of Endeavour’s final spaceflight and retirement archive.